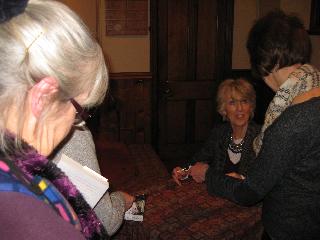 The Methodist Church was full last night for Joanna Trollope's talk on her most recent novel, The Soldier's Wife. She told us about how the book grew from the theme of one of her earlier novels, The Rector's Wife, and that she wanted to explore a present-day marriage where the wife has to fit in with her husband's career. She researched the background to the book by spending a long time talking to soldiers and their families and visiting a base to see where and how they live.